We've combined several of the popular Zeta Armor Hand Guard products into a convenient package deal. 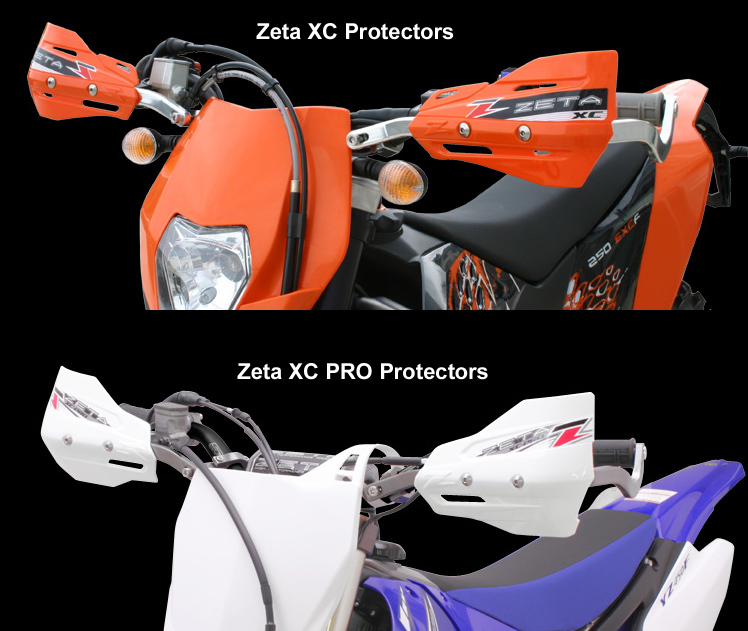 This package includes a pair of Zeta Armor Hand Guards (Bend Style) and you can optionally add your choice of the plastic Zeta XC Protectors or slightly larger Zeta XC PRO Protectors and integrated LED turn signals which integrate into the plastic protectors. 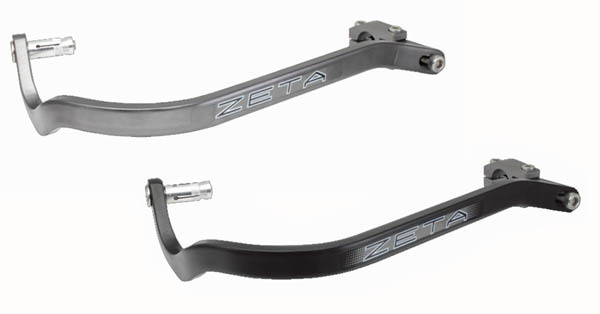 NOTE: Zeta Armor Hand Guards will fit any bike that has traditional off-road style handlebars. In addition to fitting bikes like the Yamaha WR250R/X, Honda CRF250L and Suzuki DRZ400S/SM, they should work on any dual sport, supermoto or off-road motorcycle. Most will choose the Standard handlebar clamps, but if you have a KTM / Husqvarna or bike with a hydraulic clutch master cylinder, then the U-Style clamps will work best. Mounting clamps available in Standard or U-Clamp style. U-Clamp works best for KTM / Husqvarna or other bike which uses hydraulic clutch master cylinder. Standard clamps work on most other bikes. Zeta Hand Guard Color & Clamp Style/Size: Choose color below for the aluminum Zeta Armor Hand Guards (you get one pair). Colors currently available are Black, Titanium Silver, Red, Or Blue. The handguard clamp style/size is based on your handlebar size... stock bars are typically 7/8 inch and some aftermarket bars are 1 1/8 inch. The stock Yamaha WR250R/X, Honda CRF250L and 450L, and Suzuki DRZ400S bars are 7/8". The Suzuki DRZ400SM has 1 1/8" bars. If you are unsure of your handlebar size, look at your handlebars closely... if they taper up and get larger towards the center of the bars, they are 1 1/8", otherwise they are 7/8". Zeta XC Protector Style & Color: Choose "No Thanks" if you don't want the plastic Zeta XC Protectors. Otherwise choose whether you want the Standard plastic Zeta XC Protectors or the slightly larger plastic XC PRO Protectors, and the color you want. Current color options are White, Honda CR Red, Yamaha Blue, Black, Yellow or Orange (XC Pro only available in White or Black). Zeta XC Protector LED Flashers: Choose "No Thanks" from the drop down below if you don't want the optional LED flashers for the plastic protectors. Otherwise, choose "Yes" if you want the Zeta XC / XC PRO Protectors with integrated LED turn signals in the plastic protectors (all wiring is included). Available LED lens color options are amber (orange) or smoke. NOTE 1: If you order these hand guards with the optional integrated LED Flashers, and want the LED's to also operate as running lights, you may want to order our 12oClockLabs Running Light Adapters. This device can be wired in at the time of installation and will make the integrated LED's in the hand guards also operate as running lights. NOTE 2: Optional Zeta Upper Triple Clamp Mount available separately, and can replace the harndlebar clamps that come with these. The triple clamp mount is the most secure way to mount the handguards and help keep them from rotating on the handlebar in the event of a crash.